Travelink, American Express Travel is pleased to announce our Manager of Meetings, Association Management, & Groups, Lindsay Buchanan, has been awarded the Cvent Advocate of the Year title and has also completed her Cvent Event Management Advanced certification. The Cvent Advocate of the Year award is given to the person who most contributed throughout the year to Cvent's product suite innovation through feedback, guest speaking, and participation positively impacting all Cvent users. 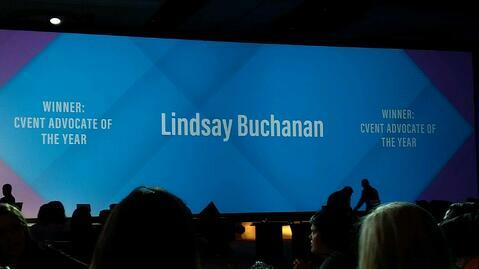 In addition to this prestigious honor, Lindsay's completion of the Cvent Event Management Advanced certification will improve her department's efficiency within the Cvent tools and elevate Travelink's Meetings, Association Management & Groups business. Cvent Certification provides an opportunity for planners to demonstrate their expertise of the Cvent Event Management planning software. Professional and Advanced levels of certification are offered for Cvent Event Management users. The Cvent Advocate of the Year Award and Cvent Advanced Certification were announced and rolled out, respectively, at the 2017 Cvent CONNNECT event in Las Vegas at the Mandalay Bay Hotel. A total of 60 individuals registered for the Advanced Certification; 93% of which completed the certification. Cvent certification is designed for the most successful and proficient users who manage one or more events annually.